Some of the most effective recovery efforts for endangered species have come from innovative ideas developed by local people. For the Mexican wolf, we recognize the importance of involvement from those in Arizona and New Mexico who live and are involved with the Mexican wolf every day. Recently, a group of local people most affected by wolves came together to work with others who are concerned with the wolves’ recovery to develop a new paradigm for addressing wolf-livestock conflicts, one of the most significant impediments to Mexican wolf recovery. The result is an innovative program that has the potential to resolve a long-standing conflict between ranchers and conservationists. The new plan avoids the problems of traditional compensation programs, which too often involve both dead livestock and dead wolves. Instead, payments are based on the presence of wolves, successful pup recruitment and the use of conflict-avoidance measures, as well as affected livestock. The payment is both a recognition that wolves can have a negative financial impact on livestock producers, and that wolf recovery represents public values related to the recovery of endangered species and ecological processes. Unlike most species protected under the Endangered Species Act, the Mexican wolf is not endangered by loss of habitat or competition with nonnative species. Instead, the Mexican wolf was extirpated in the wild as part of federal, state, and local anti-predator campaigns resulting from conflicts with livestock as settlers moved west across the United States in the early to mid-1900s. Since 1998 when Mexican wolves were reintroduced to the wild, approximately 80 percent of their diet has consisted of elk, but Mexican wolves also depredate livestock. Compensation programs for wolf depredations have been contentious due to the problems of determining the causes of livestock deaths and missing livestock. In the rough and remote areas of Arizona and New Mexico, the cause of death can be difficult to identify by the time livestock carcasses are found, if they are found at all. Dr. Benjamin Tuggle, southwest regional director of the U.S. Fish and Wildlife Service (USFWS), envisioned that the development of a solution to Mexican wolf-livestock conflicts and the economic consequences to livestock producers that accompany Mexican wolf reintroduction would be crafted by a local group representing divergent views and expertise. In 2011 Tuggle appointed the 11-member Mexican Wolf/Livestock Coexistence Council—volunteers representing livestock producers, tribes, environmental groups, and counties—to identify solutions and direct the disbursement of the Mexican Wolf/Livestock Trust Fund. The fund is administered by the nonprofit National Fish and Wildlife Foundation through an agreement with the USFWS signed in 2010. After three years of difficult but productive discussions, the Coexistence Council developed the Mexican Wolf/Livestock Coexistence Plan, which was released in March 2014. This innovative plan is founded on a goal of viable ranching, sustainable populations of Mexican wolves and healthy western landscapes. The plan includes a three-pronged approach of payment for presence of wolves, funding to implement proactive measures to reduce conflicts between Mexican wolves and livestock, and compensating ranchers for livestock killed or injured by wolves.Payment for Presence of wolves, the main component of the plan, has not been tried before in the United States. These payments recognize the costs incurred by livestock producers affected by Mexican wolves. 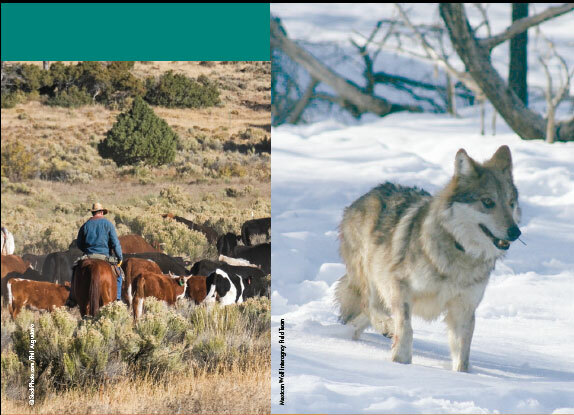 In addition to documented losses from wolf depredations, livestock producers can also incur costs from undetected depredations, changes in livestock behavior and management operations implemented in response to wolf presence. Changes in livestock behavior can result in reductions in livestock weight gain, reproductive rates, and meat quality, and changes in management operations can mean increased costs tied to managing wolf-livestock interactions. the number of livestock exposed to wolves. The plan also encourages the use of proactive measures, such as range riders, fencing and supplemental feed for livestock, to reduce the likelihood of wolf-livestock conflicts. Defenders of Wildlife and the Mexican Wolf Fund are members of the Coexistence Council and have been instrumental in assisting livestock producers in developing and funding voluntary proactive measures most effective for a particular ranch. In addition, the Coexistence Council will continue to provide depredation compensation for confirmed livestock deaths or injuries caused by Mexican wolves to livestock producers who are not receiving Payment for Presence. The Coexistence Council is seeking funding from private and public sources to implement this innovative program. At its current level of funding from the Federal Livestock Demonstration Program ($120,000 in Arizona and $70,000 in New Mexico), the council is unable to fully offset the economic losses from Mexican wolves to affected livestock producers. Nationwide, polls consistently show that the majority of people in the United States support wolf recovery, whereas local communities in the reintroduction area are often opposed due to economic impacts. This program gives the people who support wolf recovery the opportunity to engage in the recovery effort by helping to offset the economic costs to livestock producers. The Coexistence Council, the USFWS and other supporters are excited to roll out this new program. While it is not yet fully funded, we believe that it represents a new approach in addressing impediments to Mexican wolf recovery by promoting viable ranching, sustainable Mexican wolf populations and healthy western landscapes. With adequate funding, we’re hopeful that the new plan will not only help us better address local issues related to Mexican wolf recovery but also serve as a successful model to help resolve human-wildlife conflicts in a variety of other settings. For more information on the Coexistence Council and the Coexistence Plan, go to coexistencecouncil.org.